This home has lots of room. The basement is finished. The ceilings are high. This ranch style home located in Greensburg is newly remodeled. The interior is very well planned with high ceilings and generous storage areas. The kitchen and living area joined, giving an open, multi-purpose family area. There are three bedrooms upstairs and one downstairs. 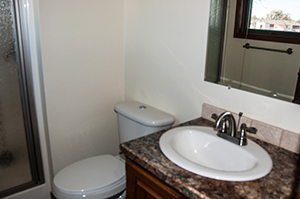 There are two bathrooms on the main floor and one bathroom in the basement. The basement is finished. There is a front porch, a patio and an attached double garage, and a safe room. If you have any questions about this home please call 316.200.5351 or 620.723.2940 and ask for Tom.